Grimlocs are plastic carabiners shaped as a "D". They are commonly used to attach puches or not very heavy equipment to packs. The design minimizes IR emission so they are stealth to night vision equipment. To open just press the top button to close press firmly. They can be used with gloves and don't get stuck with sand or dirt. I found these particularly useful with Maxpedition packs for attachment points. Available in Tan, Black and Green. 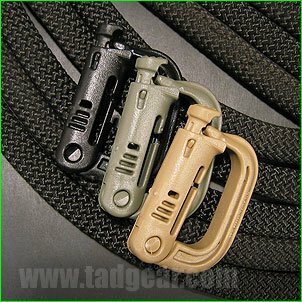 You can get them in Packs of 4 for $8 from Tad Gear and other good suppliers. Whistles are very practical, not only they are a must-have in emergencies they can also be useful to attract attention of people, lost family members, children, policemen, etc. The only problem with whistles is that the size/usefulness ratio is important since you really don't use your whistle a lot daily. Fox40 is a manufacturer that produces small whistles that are very loud the Fox40 and Fox40 mini has been in many EDC kits. Now they have released the Fox40 Micro a flat version of the popular Fox40. 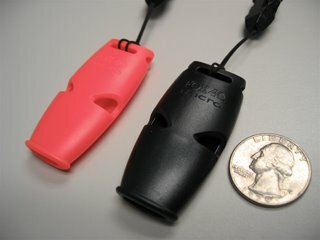 Being small and flat this Micro whistle is very EDCable, it can go unnoticed in keychains or lanyards and be ready to be used when you need it. So far you can only get it in black or orange versions. The only small downside to this whistle is that you need to blow it with some strength to use it. You can get it for $5 from CountyComm and you can read more about it in the product page. The P38 can opener is a very simple device: a small piece of stainless steel with a folding curved cutting flap. In a naive approach you use this to open cans, unfold the flap pinch the can with the tip of the flap and in 38 cuts you will have the can opened and thus the name of the device. But being able to carry this in a keychain because of its small size generated several other uses for the device. From cleaning nails to opening boxes cutting cord, etc. Some websites list hundreads of uses for the P38. Reatiling for less than a dollar a unit this is a vintage item that can be really useful. You can learn more about the P38 in this website. The Inka Pen is a modular keychain pen. It has two flavours: Titanium and Stainless Steel. I will review here the SS version. Right from the box you get a quick use keychain pen, just pull the pen from the metal keychain tube and you can write. If the pen is too short for you or you need it to write for some time you can proceed to assemble a full-size pen unscrewing some parts and screwing them back in a different order. The same goes for the stylus tip so the Inka is actually a "transformer" pen. I found the quick use pen very useful, the split ring that comes with it is too big so you may want to replace it to reduce the bulk in your keychain. The full-sized pen or the stylus to me were not very attractive since taking some seconds to "assemble" a pen before using it is not logical for a keychain pen. You want it because you can use it quickly to write something so the assembling process doesn't make a lot of sense. 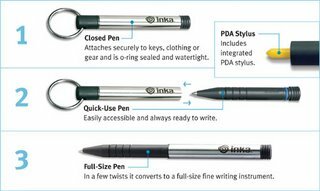 The SS version costs $24 and the Titanium version about $85 you can get them or read more at the Inka pen website.